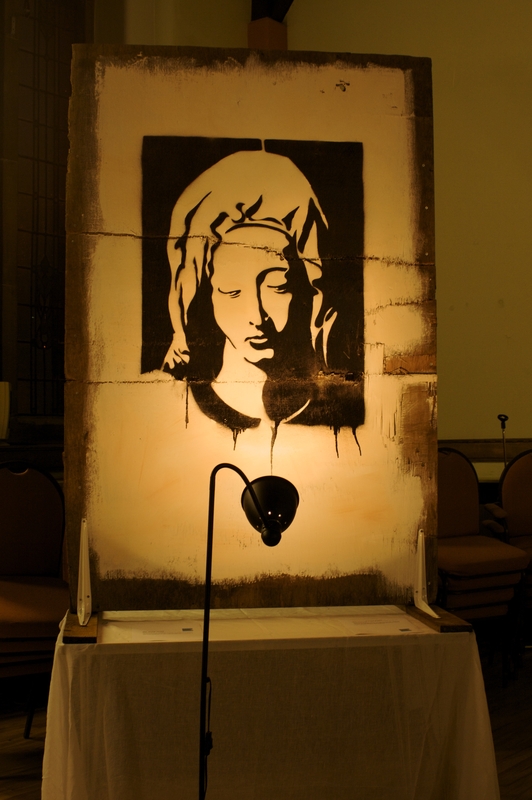 A few years ago I visited Buckfast Abbey in Devon and I remember seeing posters there for an organisation that was campaigning in the Catholic Church to have Mary recognised as co-redemptrix, intimately involved with our redemption as human beings. At the time I dismissed this as ridiculous, even a little cultish but now I’m beginning to see their point (maybe that means my belief system is becoming ridiculous and a little cultish too, but there you go). There seems to me to be something about Mary that is more accessible than the figure of Jesus. She has a strength, a warmth, and a sense of being grounded in the reality of life. Thinking of her I am reminded of a Catholic woman I stayed with on a council estate in Peterborough many years ago (who’s name I forget unfortunately), she had a whole gaggle of children in her home and was one of the holiest people I’ve ever met. She worked damn hard and had such a warm and hospitable manner – her eyes shone with life. So, whilst Jesus might feed his followers by miraculously turning a packed lunch into more than enough for 5,000 I can imagine Mary warmly welcoming me into her house, busying herself in the kitchen, helping me feel at home, and perhaps getting Jesus to do the washing up as we all chat after the meal. Whilst La Pieta shows Mary at the end of Jesus’ life, cut to the heart with grief, the Annunciation, 33 years or so earlier, is the beginning. It is a sensuous moment of terror, joy, incredulity and serious, gutsy faith. The more I think about it the more awe-inspiring task it seems to portray it, so I’m not quite sure what tack I’ll take with the piece at the moment (although I do like Phillip Pullman’s ambiguous approach in his book ‘The Good man Jesus and the scoundrel Christ’ where the ‘angel’ is portrayed as a young man sneaking into Mary’s window one night). I’ve got just over a month to finish the painting so will keep posting about the blood sweat and tears that usually accompanies making a piece like this – which will be nowhere near the literal blood, sweat and tears that Mary went through of course.